After watching a Boeing 737 being built on a moving assembly line, I thought how hard it would be to balance an assembly line with so many different job elements. 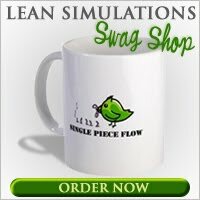 Inspired to look for a lean training game building airplanes, I found this interesting lean line balancing simulation. In this lean game, the team first analyses all the job elements and balances the line using a lean approach. After the line balancing, the team can run the game using standard push production methods, then change to a Lean pull system. The interesting part is that the teams design their own process first, presumably using standard work methods, then test their lean line balancing skills by running their own manufacturing cell they just designed. You create it, then prove it out. Can you balance this Lego plane? Given the individual steps required to build the plane, the team designs the manufacturing method, balancing the line to enable production of 12 planes in 5 minutes. Groups must time each element and determine where it fits best in sequence. Teams run their manufacturing process as designed. The group reviews the output and discusses problems, including timing and order of operations. Teams regroup and balance the line again, including discussed improvements. The improved simulation is run. What I like about this game is that there are plenty of opportunities to discuss different lean concepts. You need to introduce the concept of takt time to balance the line properly. It's a perfect way to introduce 5S with all those Lego blocks lying around. And of course, Standard Work is instrumental in line balancing. I would incorporate a batch vs pull iteration of the manufacturing line. Have one simulation go as fast as possible, then try to limit WIP and see how smooth it goes. There are a few details missing from this game, most importantly the exact steps to build the airplane. But using the picture and the names of the steps, it wouldn't be too hard to put it together yourself. I've added the Balancing Planes game to my gigantic list of lean games and simulations. More games on the site, including another version of the Cups Game. This looks like it might be a fun team building activity. I work for a big company and we are looking for some good team building things to help bring people together. Something else I might look into is team building simulations. Customer to handle their online financial investment, Trading and also retired life. Etrade Account When you open up an ETrade login account.